The U.S. Virgin Islands are an American territory, English-speaking, use the U.S. dollar, and offer a lot of choice in terms of what to do and good restaurants. The Virgin Island archipelago encompasses the three U.S. Virgins - St. Croix, St. Thomas, and St. John - and numerous islands a part of the British Virgin Islands (BVIs) in very close proximity to the USVI. Two-thirds of St. John's 28 square miles are designated National Park. Mare Blu is only a short drive from the best of everything the island of St. John has to offer. The villa is only a short distance from the festive town of Cruz Bay with its upscale shopping, trendy boutiques, gourmet markets, art galleries and fine dining. It's only a short drive to numerous bays and inlets suitable for kayaking, scuba diving, sailing, power boating and also to the renowned National Park beaches for a leisurely day of snorkeling, hiking or simply relaxing on powder white sand. Ferry: Catch the hourly on the hour ferry from Red Hook on the east end of St. Thomas (a 30-minute taxi ride from the airport) or the ferry from Charlotte Amalie (near the airport but much less frequent). The ferry dock in St. John is right in the center of town in Cruz Bay. 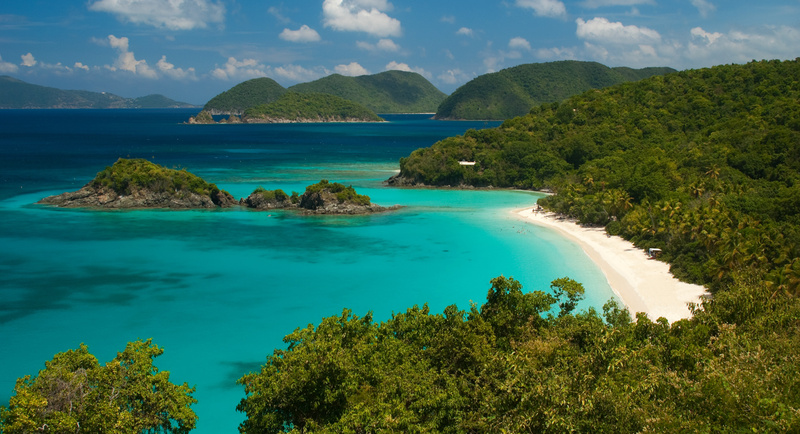 Geography: St. John has numerous beaches, one qualifying in the top ten beaches in the world, with wonderful snorkeling, interesting and sedate hiking trails, plantation ruins, and coral reefs teeming with life. Rising steeply and quickly from the shore, St. John's ridges climax in three peaks of 1,100 to 1,200 ft. There are over 800 species of plants. More than 160 species of birds have been recorded in and around the park and, of these over 25 nests on the island. You will need a passport to visit the British Virgin Islands, which you may very well want to do, so we highly recommend having a Passport with you. When departing the U.S. Virgin Islands, U.S. Immigration requires all persons, including Americans, to provide proof of citizenship. This can include a passport or a photo ID.